Pisba is a municipality in the Colombian Department of Boyacá, part of the the subregion of the La Libertad Province. It was founded on 3 April 1629. The flag of Pisba is horizontally divided (inner ratio 2:1:1) blue-white-green and charged with a yellow rhombus with a circle divided horizontally green-grey. there is a slightly different image on the same page. Translated from municipal web site: "Rectangular with the colours blue (50%), white (25%) and green (25%), in the middle a yellow lozenge with a circle inscribed, green in its upper part and gray in its lower part." 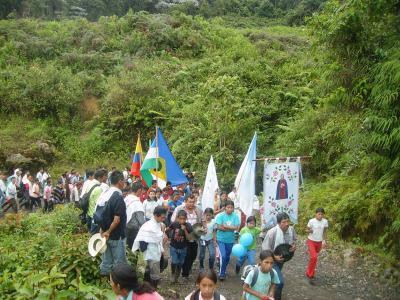 The flag is shown on a photograph taken during the Marian pilgrimage (31 May). The flag seems to be in proportions 1:2, with the lozenge placed horizontally (horizontal axis bigger than vertical axis); the lower point of the lozenge touches the upper edge of the green stripe, while the horizontal axis of the lozenge matches the limit between the blue and white stripes, which means that the upper point of the lozenge reaches the half of the blue stripe. Concerning the circle, the limit between the two fields seems to be wavy, as far as it can be seen, and the lower field seems brown rather than gray. Accordingly, none of the two drawings shown on the municipal website match the real flag. Obviously neither image on the municipal web site could be correct, as neither had the centred rhombus on the blue white middle line.